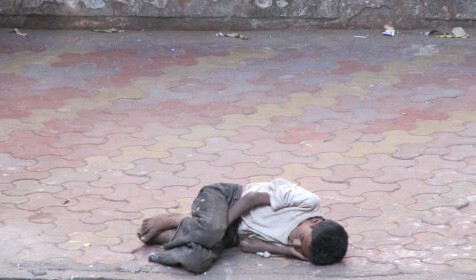 A homeless boy in India. WeGain Zone in Kathmandu, Nepal is an all vegan center, sitting as a peaceful sanctuary amongst the hustle of the country’s most hectic, polluted city. The center offers a safe space with lush green yards, organic gardening, and infrastructure built from composted materials. There is a library, a kitchen, free NGO office space, and a film screen for educational videos. You won’t find any non-human animals at the peaceful vegan center because its largest impact is as a shelter for street kids. Nearly 2,000 homeless boys wander the streets of Kathmandu: they lack government support and are generally ignored by society. Many children face abuse and exploitation and generally suffer from substance abuse. WeGain Zone, through vegan ethics of care and equality, chooses to make a difference. WeGain provides a safe home, living essentials, a formal education, and the feeling of family – the closest to family life the children may ever have. WeGain also provides humane education, gives the children a sense of responsibility, teaches virtues such as compassion, and provides the children with the knowledge needed to think critically about social justice issues and humanity’s environmental footsteps. The Viskahapatnam Society for Care and Protection of Animals is an NGO in Andhra Pradesh, India making great strides to help both human and non-human animals. The multi-faceted organization runs two animal sanctuaries, engages in wildlife conservation, policy and legal work, and many other projects. In 2010 the organization widened its mission to support society’s most vulnerable populations, by making strides to improve the welfare of the city’s homeless community. In India, one in every 500 people is homeless. Beggars of all ages, makeshift tent homes, and children sleeping on sidewalks are a common sight. There is little government support and the homeless are often overlooked by society. But VSPCA, through vegan ethics of care and equality, chooses to make a difference. Thrice weekly, staff and volunteers drive across the city in the “Kindness Mobile Restaurant” distributing traditional Indian vegan meals. Seeking a way to simultaneously help both the humans and the non-human animals, the NGO provides first to individuals who are caring for a street dog or have otherwise shown compassion towards animals. Because feeding the homeless seemingly appears outside the NGO’s mission, the project consequently gains public inquiry as to why an animal NGO is helping people. These inquiries are welcomed and offer ample opportunity for education on social justice, and the intersection of human rights and animal rights. Animal rights shines focus on those who are invisible within our society – the animals. But as the status of animals within societies change, consequently other social paradigms change: paradigms surrounding equality, hierarchies, and within some cultures, caste systems. As these two projects show, as well as many additional projects across the globe, the animal rights movement through vegan ethics advocates not only for animals, but also for justice and equality for all species on the planet.